Apple will deliver a new iOS 5 release this fall, including improvements from the core OS to developer APIs to the interface seen by customers. 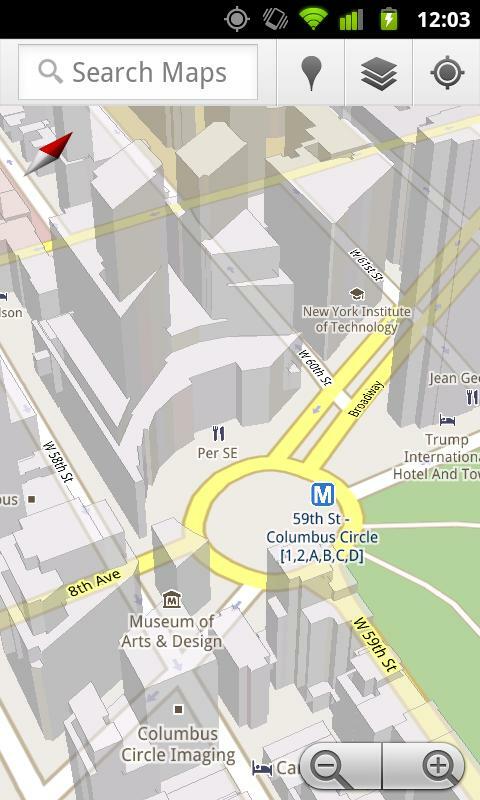 Among these new changes is a revamped Maps app. 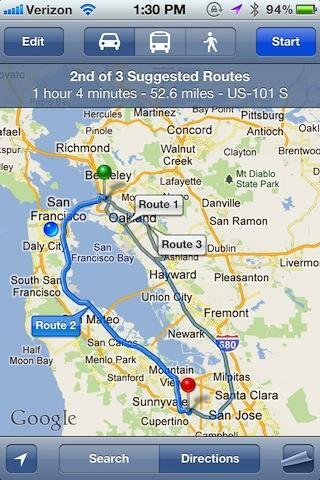 Apple's iOS Maps app is a front end client to the Google Maps web service. While it was rumored that Apple might build its own mapping service or switch to another provider like Microsoft Bing, iOS 5 continues to use Google Maps for its data. Apple's cleverly easy to use iOS Maps app with direct multitouch manipulation has been confused for being a Google invention. Instead, it simply pulls data from Google and presents it in a way that's simple and fast to browse, making it about as essential as Mobile Safari, and of course much easier to use (particularly for mobile users) than the generic web client Google offers within the browser. 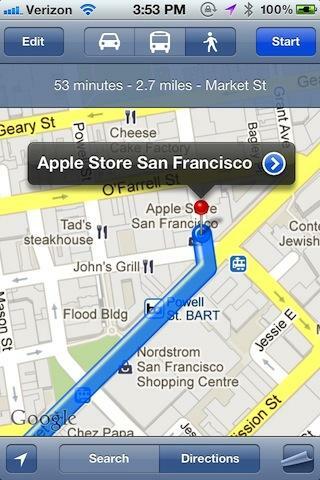 Apple has incrementally added features to its iOS Maps client, including transit and walking directions. 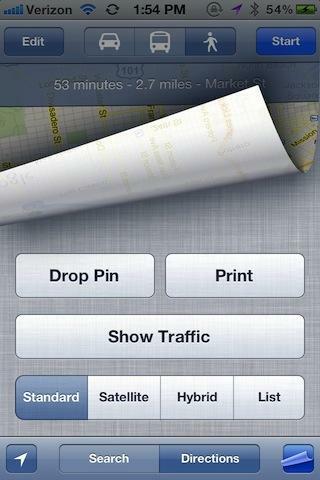 The newest version in iOS 5 ads the ability to print maps via AirPrint, as well as emphasizing its suggested directional paths using a glossy, three dimensional tube line. The new iOS 5 Maps app also has a new feature that suggests multiple routes, allowing the user to chose between a few options before stepping through the directions to the destination. Below, there are three options given for driving from Pixar to Apple, and selecting between them shows distance and approximate driving times. 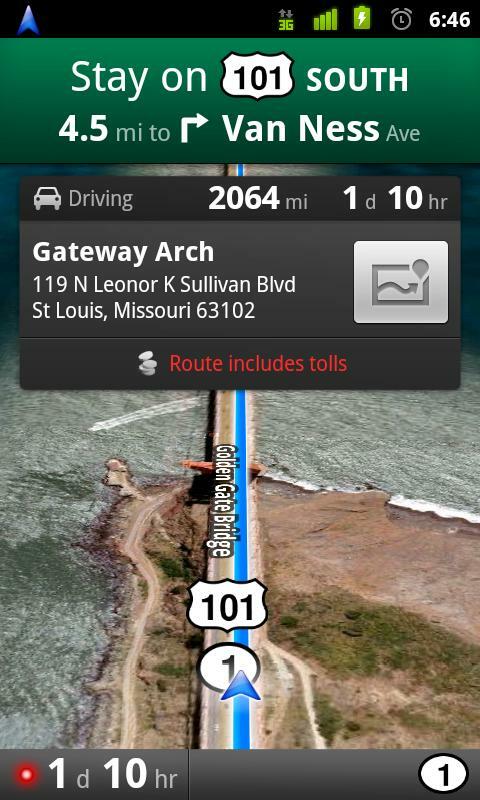 after selecting a route, Maps' directions will then fetch detailed instructions. Apple's Maps client doesn't do everything Google Map's own web client can do, and even lacks some of the features of Google's Android mobile maps client. For example, there's no way to browse in "Google Earth" perspective view, taking advantage of the 3D buildings Google has on its servers. Google has promoted this as a unique feature of tablets running Android 3.0 Honeycomb as part of that operating system's overall 3D interface. On the iPhone, there's no terrain view showing topography (although the iPad version currently offers this). There's also no support for Google Maps Navigation, a turn by turn service Google began similarly promoting as a unique feature of Google Maps for Android smartphones. Google's own Maps client for Android also incorporates the company's Places (a clone of Yelp) and Latitude (a clone Loopt). Apple is unlikely to ever add support for either of Google's map add-on services, and also looks unlikely to add Google Navigation support, all of which would directly encroach upon third party iOS developers. In contrast, Google created Android primarily with the intent of making sure that mobile users were using its services. It therefore has little concern for third party developers of GPS or other location based apps that its Google Maps Navigation app for Android has essentially pushed out of the market. Rather than incorporating additional dependence upon Google's proprietary maps enhancements, Apple appears interested in building its own mapping features and client-side enhancements, and may eventually wean itself off of Google's map service entirely, allowing the company to either open up its iOS Maps client to competing map services (as Apple has done in opening mobile web search up to Yahoo and Bing), or potentially building its own maps backend. Either route toward non-Google mapping would be complex, in part because Apple's Maps client has close integration with Google's map service, but also because Apple weaves a mapping API throughout iOS to enable third parties to present interactive maps within their own apps. While Microsoft, for example, makes its own tools that allow developers to incorporate Bing maps into their apps, Apple's APIs currently only work with Google's mapping service. 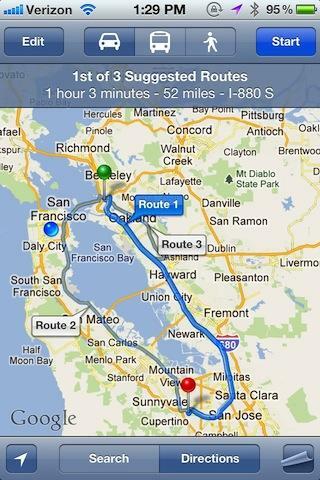 Apple was rumored to begin taking steps away from Google maps as early as iOS 5, but that clearly hasn't materialized. At the same time, there is evidence that Apple is looking at enhancing the way it presents maps independently from Google. 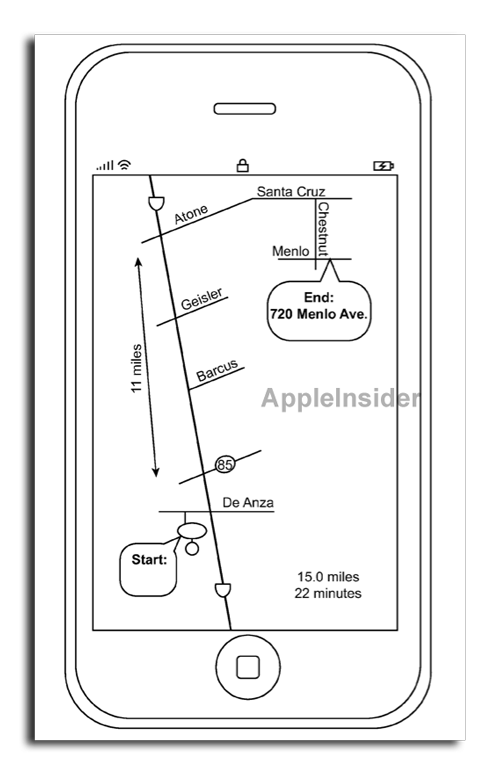 A recent patent filing for "Schematic Maps" shows Apple is interested in presenting mobile maps that show simplified information, rather than a very complex map including "confusing and inefficient" amounts of detail. Apple already maintains its own database of location data, and stated it was working on crowd sourcing traffic data that would eventually make it into shipping products in the next couple years. The company has also acquired small companies with mapping expertise, including Placebase in 2009 and Poly9 last year. The company has also stated an intention to "radically" improve its iPhone Maps application in a recent job listing.